대적광전을 중심으로 하여 동·서쪽에 서 있는 쌍탑으로, 신라 헌안왕 3년(859)에 도선국사가 세웠다는 설이 전해온다. 앞 뜰이 좁아서 탑과 법당과의 거리가 가깝다. 동탑은 단층의 기단(基壇) 위에 3층의 탑신(塔身)을 올린 모습으로 기단의 각 면에는 모서리기둥을 얕게 새겼다. 탑신부에서는 1층 몸돌이 위가 좁고 밑이 넓은 독특한 형태를 보이고 있는데, 각 면에는 4각형의 감실(龕室:불상을 모시는 방)을 두고 그 안에 여래좌상을 도드라지게 새겼다. 2·3층의 몸돌에는 각 모서리 마다 기둥 모양을 새겨 놓았다. 지붕돌은 얇고 넓으며, 받침은 4단으로 구성되어 있다. 서탑은 2단의 기단 위에 3층의 탑신을 올렸다. 1층 몸돌에 비해 2층 몸돌이 크게 줄었으나 3층 몸돌은 2층과 비슷하다. 1층 몸돌의 각 모서리에는 기둥만 새겨져 있고, 그 사이에 여래좌상이 조각되어 있다. 지붕돌은 동탑보다 얇고 넓으며 밑받침은 5단이다. 두 탑은 통일신라 중기 이후에 만들어진 것으로 짐작되며, 곳곳에서 특이한 수법을 보여주고 있는데, 동탑은 1층 몸돌의 위가 좁고 감실을 두고 있다는 점이 특징이고 서탑은 지붕돌 밑의 간격과 지붕돌이 넓다는 것이 특징이다. 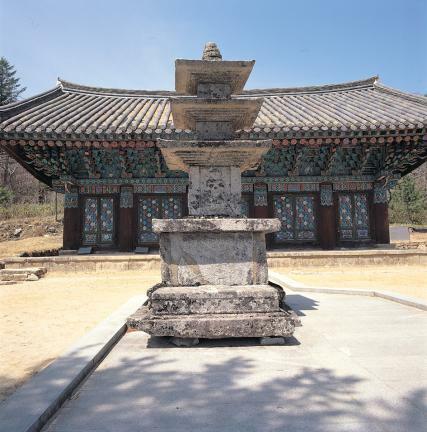 These twin pagodas standing side by side to the east and the west of the Daeungjeon Hall, is believed to have been made by Doseon, a Buddhist monk who served as the State Preceptor of Silla (the 3rd year of the reign of King Heonan). 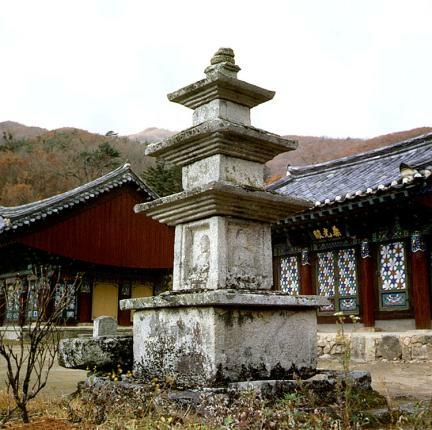 Due to the small size of the front year, the pagodas are not far away from the main hall. 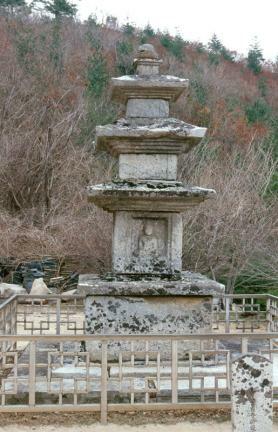 The east pagoda, standing on a single-story pedestal, has three stories. The side of each pedestal is engraved with a column pattern. 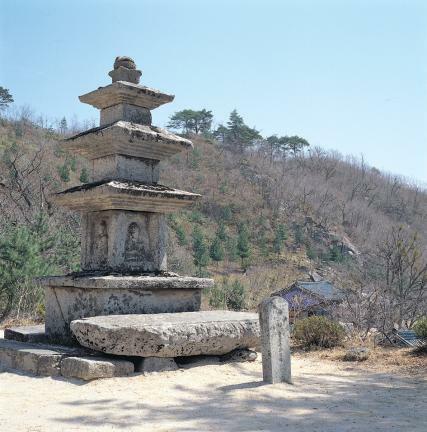 What makes this pagoda unique is that its first tier is narrowed to the top. 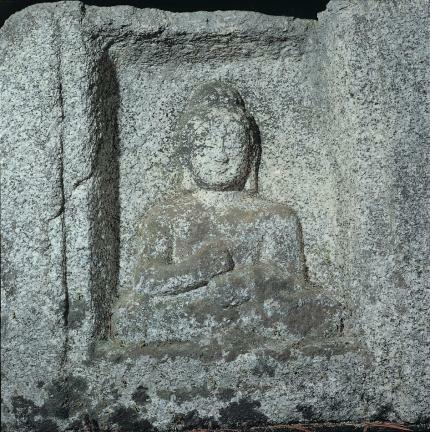 Each side of the first tier is engraved with a seated Bodhisattva inside a rectangular box, while the second and third tiers are engraved with a column pattern on each side. The capstone is thin and broad, while the stone pedestal at the bottom has four steps. 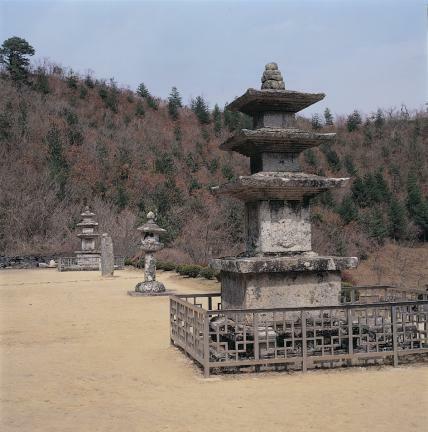 The west pagoda is also three-storied, but stands on the two-story pedestal. 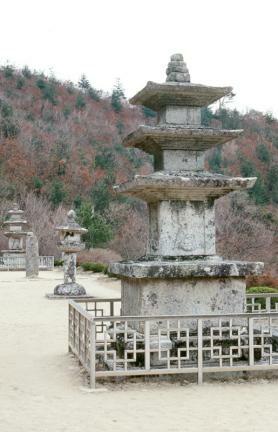 The second tier of the pagoda is much smaller than the first tier, but the third tier is similar in size with the second tier. 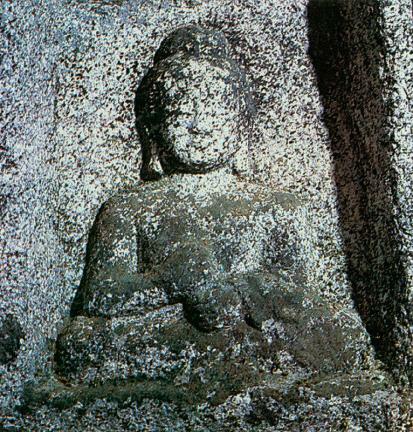 A column pattern is engraved on the edge of the main tier with a seated Bodhisattva engraved between them. 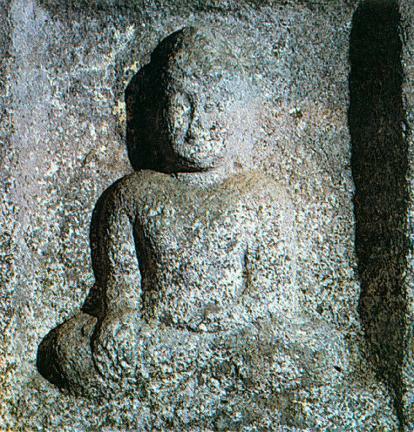 Compared to the east pagoda, its capstone is thinner and broader. The pedestal has five steps. These twin pagodas have a couple of unique features that are not found in other pagodas: The first tier of the east pagoda is narrowed to the top and the Bodhisattvas are engraved inside a rectangular box, while the west pagoda has a wider capstone and more space underneath the capstone. 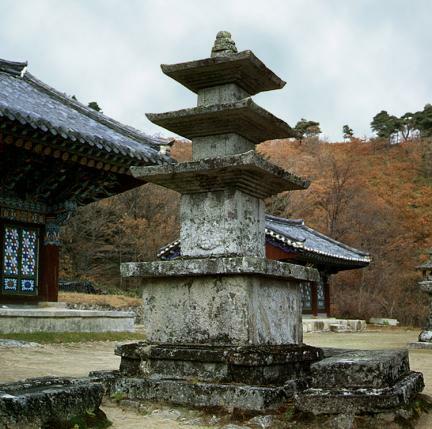 The carving skills indicate that these pagodas were built in the middle of the Silla period.